Our relationship with plastic is a complicated one. "We're sitting on it right now. Our clothing has it in it. Plastic makes our lives easier. And it's cheap," said Jaclyn Wegner, the Shedd's director of conservation action. But, she added, "It's a detriment to our environment." Wegner was the third speaker in our series of Monday lunchtime talks at the McCormick Bridgehouse & Chicago River Museum. Appearing on July 23, Wegner spoke about single-use plastics and how they can harm nature. 3. A wrinkle has emerged in the effort to get rid of plastic straws: Some people with disabilities say they need them to eat and drink. Shedd has been working with groups to address that problem and recommends that restaurants keep straws on site for use by people who need them to drink or eat. 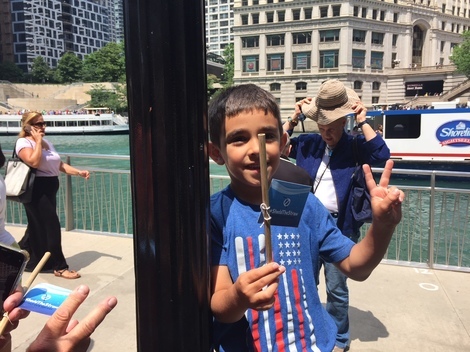 Wegner handed out straws made of bamboo Shedd distributes as part of its Shedd the Straw campaign. Friends of the Chicago River has been working to improve the Chicago River for nearly 40 years, including hosting the annual Chicago River Day that cleans up trash at dozens of locations. Our North Shore Channel #LoseTheLitter campaign has been a tremendous success as well. July 30: Jennifer Wasik, Principal Environmental Scientist, Metropolitan Water Reclamation District, on river water quality. In the event of rain, follow @bridgehousemuse on Twitter or call (312) 977-0227.